It's only 0.7 inch thick, and it weighs just 3.35 pounds (3.8 pounds with power block), but the 13.3-inch Samsung Series 5 NP535U3C doesn't qualify as an Ultrabook. The reason? "Ultrabook" is a trademark belonging to Intel--and the Series 5 NP535U3C doesn't use an Intel processor. Instead, it has a 2.1GHz dual-core AMD Fusion A6-4455M processor. The crucial question: Can this ultrathin, AMD-based ultraportable laptop hold its own in an Ultrabook world? We tested it to find out. Our review model, priced at $699 (as of August 6, 2012) as configured, sports an AMD Fusion A6-4455M processor, 4GB of RAM, a 500GB hard drive, and a 13.3-inch screen. It also offers 802.11a/b/g/n Wi-Fi, Bluetooth 4.0, and a built-in 1.3MP webcam. The Series 5 runs a 64-bit version of Windows 7 Home Premium. 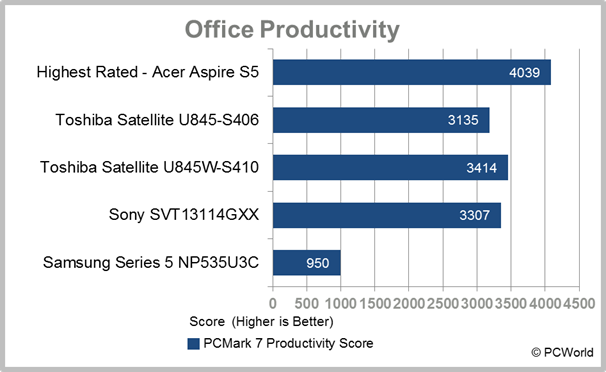 Diehard AMD fans will be saddened to learn that the Series 5 NP535U3C doesn't quite match the performance of its Ultrabook counterparts. In PCWorld's WorldBench 7 benchmark tests, the Series 5 earned a rather puny 62 out of 100, meaning that it's speed was only 62 percent of our testing model's. 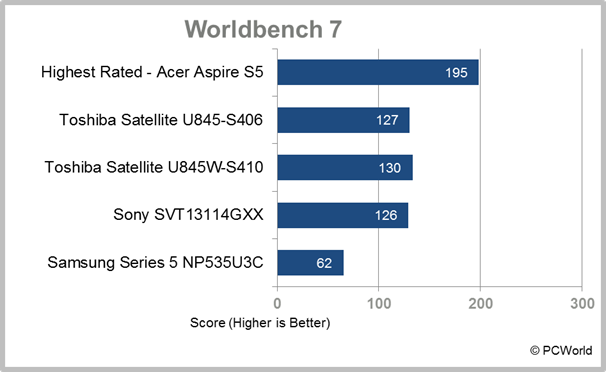 The average WorldBench 7 score for the most recent three Ultrabooks we tested was 127.7. To be fair, the WorldBench 7 tests take more than just processor speed into account, so components other than the AMD processor may share responsibility for the Series 5's poor showing. 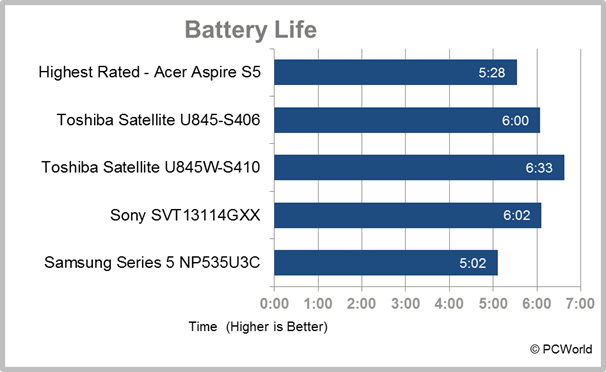 For instance, a major factor in WorldBench 7 tests is storage and startup speed; and one Ultrabook requirement is speedy boot-up times, which many Ultrabooks accomplish by using a small SSD caching drive plus Intel’s Smart Response technology. 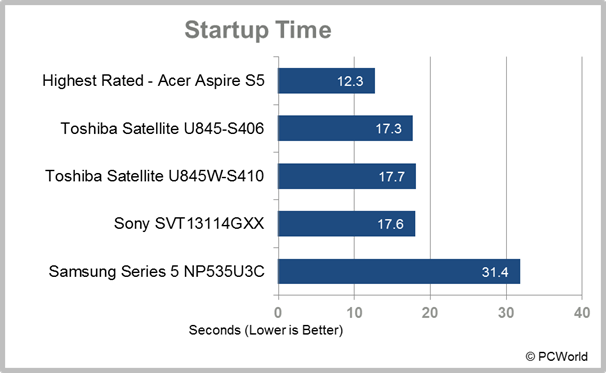 This Series 5 doesn't have an SSD cache drive, so its startup time is comparatively slow (31.4 seconds versus 12.3 seconds for the much speedier Acer Aspire S5). The Series 5's 13.3-inch matte LED-backlit display has a native resolution of 1366 by 768 pixels. The screen features SuperBright Technology, which in our assessments appeared to live up to its name: The screen was quite bright, making it is usable even in very harsh lighting. Colors seemed accurate for the most part, though whites occasionally took on a bluish tint; text and images looked crisp. Off-axis viewing angles, especially the vertical angles, were poor, however, and viewing the screen from a less-than-optimum position yielded darker, contrasty images. You shouldn't write off the Samsung Series 5 NP535U3C just because it has an AMD processor instead of an Intel processor. Though Intel's Ultrabooks may outperform the AMD Series 5 overall, the Series 5's integrated Radeon HD 7500G graphics are slightly more impressive than Intel's HD 4000 integrated graphics. In addition, theAMD Series 5 is $100 cheaper than its Intel counterpart, and it has excellent speakers for the category. So if you're looking for an ultraportable multimedia machine--and you're not too picky about startup time or branding--the Series 5 deserves a look. AMD-powered ultraportable laptop is as thin and light as an Ultrabook, but can't match the performance of its Intel-based rivals.